Patrick finds an urgent message on his computer from Max — he needs Patrick's help. Patrick makes his way to the TV shop to be transported across the time barrier, leaving his cousin Carol at the clock. She discovers a strange ball and when she goes to tell Patrick about it she sees him transported into the barrier. Carol runs to the spot where Patrick disappeared and she too is transported. Things are bad on the other side, time is all over the place and Finders Keepers has been closed down having been deemed a threat to the barrier. Disaster looms as the number of breaks in the barrier are multiplying. Trying to solve the problem, Max asks for Patrick's help and prepares to send Patrick back to find the clockmaker and fix the clock but just as Max is about to send him home, agents burst in and arrest Max, leaving Patrick trapped inside the barrier. Meanwhile, Carol is left stranded on the other side of the barrier, lost in a hostile environment. Patrick makes it through to the shopping centre only to find that time has passed and the malfunctioning clock has been taken away. He runs into his distraught sister who has been looking for them both for hours. Patrick realises that Carol must have followed him to the other side and they rush home hoping to contact Max. 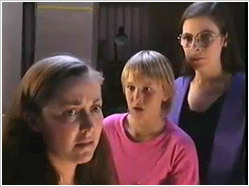 With Max in the custody of the barrier agents, it is Estelle who makes contact through Patrick's computer but Claire takes some convincing to believe Patrick's story about what has happened to their cousin. Carol has an encounter with some barrier guards who try to take her ball away. It displays magic qualities and burns one of the agent's hands. With Claire's help, Patrick is able to locate the shopping centre clock at a warehouse. Carol is confronted by Parsons, a senior agent. Carol eludes Parsons and the barrier agents yet again and makes her way towards the time barrier. Her ball effects the barrier and causes a serious outbreak of Time Stream. Patrick and Claire find a poem on the clock that helps them locate the clock maker, Anna Varga. She is sick in hospital where Patrick goes to find her. The Time Stream travels from the barrier into the TV station where it breaks throughs a wall. Max works out a way to get back into his room. Patrick finds Anna Varga and asks for her help to fix the malfunctioning clock. When he tells her the clock has been moved, she is adamant she be taken to the clock. Lives are at stake. Carol has not moved from the barrier as night falls and Parsons decides to fire a mend gun at Carol to push her into the barrier. McCready, the senior barrier agent, arrives and stops Parsons' mend gun, saving Carol who continues to sit near the barrier. Max creates a device to affect Lucky so he and Estelle can get back into his lab under the guise of fixing Lucky. Patrick brings Anna Varga to the clock and she is able to perform a temporary repair on its mechanism but the clock's crystal regulator, the "holder of time", is missing and needs to be found and the clock returned to the shopping centre. Max contacts Patrick and learns from Anna Varga that she is linked to the clock in some way and has also sustained damage. 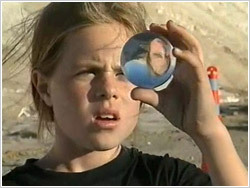 McCready wants Max arrested again… he is sure that Max is somehow connected to Carol and her strange ball. Max appeals to McCready that the cause f all their trouble with the barrier is a damaged clock on the other side but the agent does not believe him and puts him in isolation. Estelle finds Carol at the barrier and tries to bring her down but Parsons interferes and a frightened Carol jumps into the barrier. Estelle calls Patrick to tell him what has happened to Carol and he uses the device Max gave him to enter the barrier. After finding Carol Patrick loses the device which is their only way out. Claire helps Anna Varga move the clock back to the shopping centre, the only place it can be fixed, but the Time Keeper gets damaged. Meanwhile, McCready, who knows there are two children stuck in the barrier, has doubts, maybe Max is right. He goes to Max's lab to shift Patrick and Carol out of the barrier, and is confronted by Estelle. Max arrives having escaped isolation and he, with the help of Anna Varga on the other side to guide them, shifts Patrick and Carol out of the barrier and back to the shopping centre. Carol's ball, the clock's regulator, is replaced in the Time Keeper and when it merges with Anna Varga, a new clock is born and the time barrier is restored.